Our route through Thailand in early 2007. Language: Thai. Some English is spoken, especially in the touristed areas. Population: About 62 million as of 2001, with 10% living near Bangkok. 75% are ethnic Thais, 11% are Chinese, 3.5% Malays, and the rest are non-Thai speaking groups from the rest of SE Asia. Landscape: SE Thailand has a long western coastline with many offshore islands, some with high limestone cliffs and caves. Central Thailand is a bit arid, with scattered trees and scrub. Large rivers cut the landscape. In the north, and NW along the Burma border lie the mountains, dubbed "Foothills to the Himalaya" and rising to over 2500m (8250 ft) from the deep gorges of the Brahmaputra River in Myanmar (Burma). Visited: 1 January to 10 February 2007 by boat. Then again from 13‑23 February 2007 traveling inland, having left Ocelot at a marina in Langkawi, Malaysia. See also the Newsletters we sent out while we were in Thailand, as well as our Thailand Diving page. A very brief History: To speak of the pre-history of “Thailand” is a bit of a conundrum because there was no area known as Thailand until (relatively) very recently. More than 10,000 years ago, peoples of the region worked bronze, and about 3,000 BC they were already cultivating rice. Whether these were the ancestors of today’s Thais is not known, but it is fairly certain that there were many migrations of people of Austro‑Thai language who populated the valleys and hills of SE Asia. By the 10th century AD, small settlements or city‑states, called “meuang” existed throughout the region from what is today Vietnam west to Assam (NE India). Agriculture was well established by the 6th century, and later there was a collective group of meuang which became the Dvaravati culture. Their contributions to art include early Buddhist reliefs and sculptures. 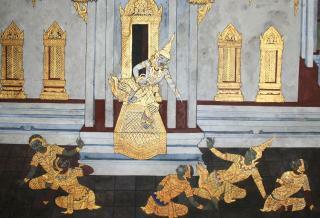 The Khmers invaded in the 11th century and the Dvaravati culture declined rapidly. From this era came the architecture and art of the Angkor culture, and there is much evidence of Theravada and Mahayana Buddhism which persist today in Thai culture. The Khmer culture was spread across all of today’s Cambodia, much of Laos and Thailand, and it was the Khmers who called the Thai people Shyama, which morphed into Syam. In the 1500’s an Englishman changed this to “Siam”, the previous name of Thailand. Sukhothai, the first real Thai kingdom, was created in the 13th and 14th centuries as Angkor was declining. It was during this era that modern Thai writing was developed, and it's considered the “golden age” of Thai history. The Ayuthaya Kingdom annexed Sukhothai in 1376, and it remained united until 1769, having had friendly and diplomatic relationships with Europeans from Portugal, The Netherlands and England. The Kingdom fell to the Burmese in the late 1700’s, and was soon again overthrown by a Chinese‑Thai general, Phraya Taksin, who proclaimed himself king and “the next Buddha.” He was executed by his ministers for his outrageous claims. 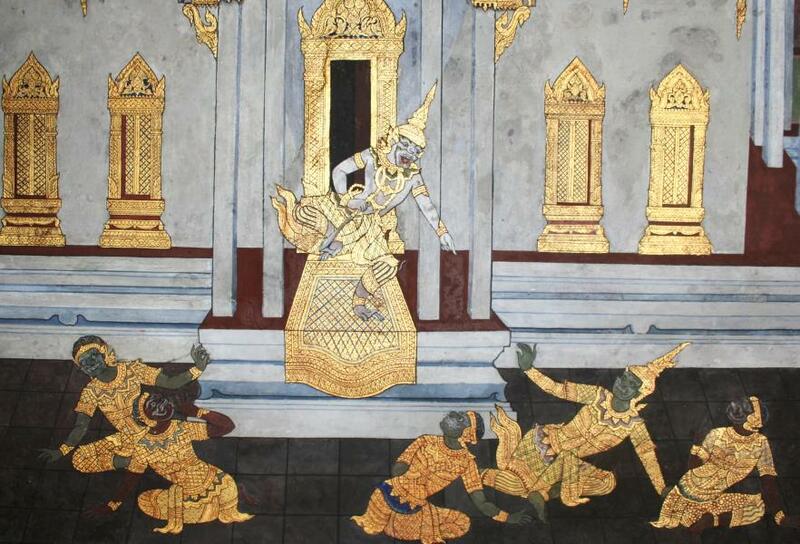 One of Taksin’s generals, Chao Phraya Chakri, was crowned in 1782 and he moved the capital across the river to present-day Bangkok, thus beginning the long Chakri reign, with kings known as Rama I through Rama IX. 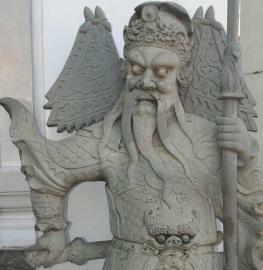 The 18th and 19th centuries saw a slow acceptance of Western ideas into Thai culture. Slavery and prostration before the king were abolished, railways were built, the western calendar was adopted and educational reforms were implemented. A bloodless coup in 1932, led by Thai students living in Paris, led to the establishment of a constitutional monarchy similar to Britain’s. The king abdicated, and although his 10 year-old nephew Ananda Mahidol was promoted to the throne as Rama VIII, a top military leader of the coup, Phibul Songkhram, took the reins of government from 1938 until the end of WW II. When the Japanese invaded SE Asia in 1941, the Phibul government sided with the Japanese, but the ambassador in Washington DC refused to deliver the declaration. It was that ambassador, Seni Pramoj, who took over the Thai government after V-J Day in 1945. The following decades saw coup after coup, with the abolition of both the constitution and political parties, and the country under military rule. There was wave after wave of unrest with students protesting the lack of a constitution, and bloody battles being fought in the streets. It was not until the 1980’s that some form of stability arrived and dissenting political views could once again be voiced. In 1991 Thailand’s 10th successful coup since 1932 brought to power the National Peace-Keeping Council (NPKC) led by General Suchinda Kraprayoon. A civilian prime minister was chosen and a new constitution passed, allowing the government, no matter who the prime minister might be, to remain in the hands of the military. A series of elections and demonstrations marked the passage of the 1990’s, followed by major economic collapse along with the rest of Asia in 1997. Today, still reeling politically and economically, the country is nonetheless trying to move into true democratic status. Overview: We visited Thailand by boat (up the south-western coast and the offshore islands in the Andaman Sea) and by train, plane, bus, car and on foot in the interior. 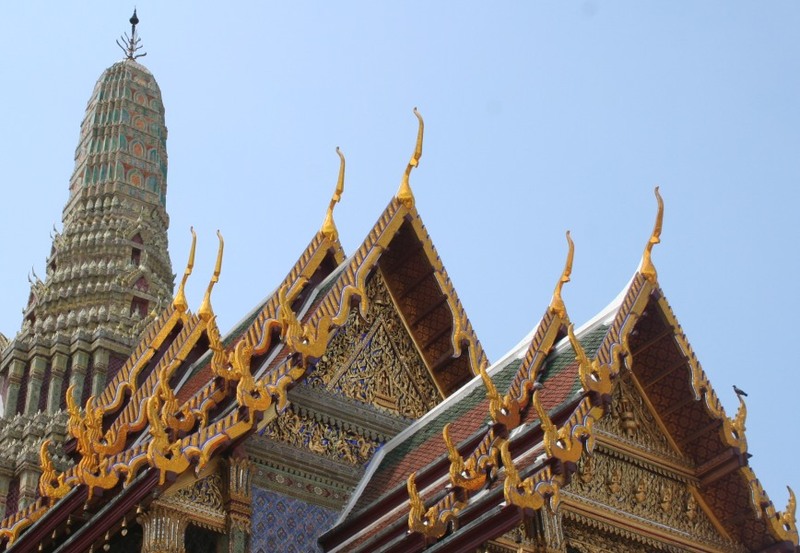 (Sue) My only previous visits to Thailand were en route back and forth from Nepal, and always in April or June when the heat and humidity were vying for top rating. These were short stays in Bangkok in the 1980's and 1990's. It was with great pleasure, then, that we had the time to explore much more of the country, both by boat and by land, in the winter season when the heat is much more bearable. (Jon) Before we got there, Thailand always seemed so exotic to me. While it's always dangerous to come to a place with expectations, Thailand actually surpassed my expectations -- diving in the clear waters of the Similan Islands, trekking through the northern highlands, riding elephants down mountain streams, experiencing the grandeur of the magnificently ornate temples, paddling through long caves to emerge in towering hongs, and especially being able to savor the exquisite Thai curries at dozens of fine (and wonderfully inexpensive) restaurants. Copyright © 2000‑2019 Contact: Jon and Sue Hacking -- HackingFamily.com, svOcelot.com. All rights reserved.